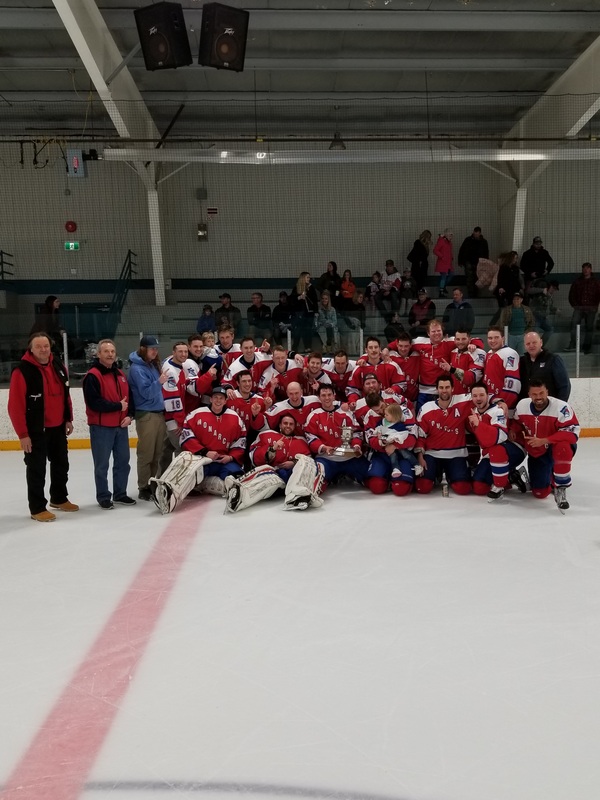 The Lumsden Monarchs defeated the Raymore Rockets 9-0 on Sunday and are the 2019 Highway Hockey Champions. This is the first championship for the Monarchs since 2002. Lumsden scored twice in the first period, four times in the second period and three times in the third period. Braeden Adamyk had a hat trick in this game. Brody Luhning had a power play goal and an even strength goal and Tyler Penny also scored on the power play. Jesse Matlock, Kyle Johnson and Mason Haus also scored for the Monarchs. Travis Bosch picked up the shutout in net for the Monarchs stopping 15 shots. Riley Focht- Gabriel faced 53 shots in the Raymore net. Lumsden went 2 for 4 on the power play and Raymore was 0 for 3. Each team was assesed two major penalties and game misconducts. League awards were presented to recipients from the Monarchs and Rockets after the first period. This brings to close our 2018-19 season. I would like to thank all of our Managers for the work they do keeping senior hockey alive in their communities. There has to be someone in every community who keeps senior hockey alive and our Managers are integral in making that happen. To the volunteers in our rinks that are at the door, or selling 50/50 tickets or acting as "spotters" for our Tweets thank you for your help. To my fellow officials that are in the box for each and every game, thank you.Thank you to Greg Soroka and the Referees and Linesmen that work our games. Most importantly, thank you to our players that commit to senior hockey. Whether it is a quiet evening in November or a full rink during playoffs or Provincials we all love watching the exciting brand of senior hockey that you bring us. To the fans, thank you for supporting senior hockey locally and throughout our province. We all have the same goals and your support is so important. Our league will be having a spring meeting. This meeting pertains to rules and regulations and discussion about the next year of senior hockey. I will update after we have this meeting.